A dystopian satire, Brazil is an imaginative fantasy both mocking the growing incompetence of out-of-control government and chillingly predicting a miserable future. 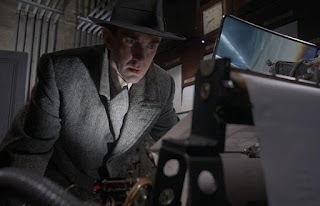 In a dystopian alternative reality resembling the totalitarian regime of 1984 gone sideways, Sam Lowry (Jonathan Pryce) is a government bureaucrat working in the mammoth Ministry of Information. With the regime under threat from frequent terrorist bombings, Sam experiences weird dreams featuring themes of flying, escaping from reality, and the love of a beautiful woman. While investigating a government paperwork mix-up between the names Buttle and Tuttle that resulted in the wrong man being seized, tortured and killed, Sam spots the charismatic but elusive Jill Layton (Kim Greist) and realizes that she is the woman from his dreams. Breaking every possible rule, Sam uses the influence of his mother Ida (Katherine Helmond) to track down Jill, earning the wrath of the regime. 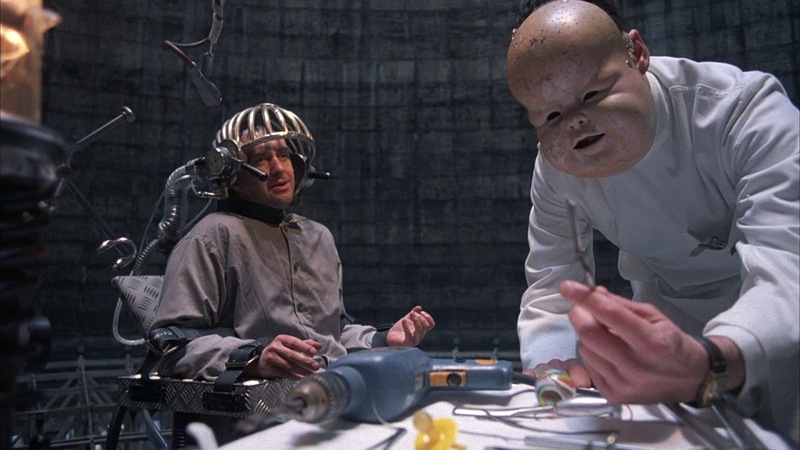 Directed and co-written by Terry Gilliam, Brazil is a quirky and unique masterpiece. The film creates a stunning world far detached from reality and yet starkly familiar in capturing the twin threats of all private information in government hands and an all-powerful yet totally inept ruling structure maintaining control through secret repression and public platitudes. And a culture of official forms run amok. By adding a layer of insidious gallows humour, Gilliam perfects a dark surrender to the inevitable. Brazil's initial US release was famously botched by Universal Studios. The ending was changed, the running length was shortened, and the film fell flat. International audiences saw Gilliam's original 142 minute cut, and that version now endures as a classic. Brazil thrives on its fantastical weirdness. Around the story of Sam' search for an escape through his idealistic pursuit of an unattainable Jill, Gilliam creates a world sinking into outlandish creepiness and dominated by...ducts. Bombs go off and are ignored. Sam's friend Jack (Michael Palin) has moved up in the bureaucracy and achieved the exalted level of torturer. Archibald "Harry" Tuttle (Robert De Niro) is a renegade mechanic who epitomizes subversive resistance against the regime by actually fixing things. His opposite character is Spoor (Bob Hoskins), a gleeful employee of Central Services. There's more. Sam's mother Ida and her friends are obsessed with - and victimized by - the latest face lift surgery techniques. Sam's manager Mr. Kurtzmann (Ian Holm) can get nothing done without Sam, and therefore spends his days worrying about Sam getting promoted. Deputy Minister Mr. Helpmann (Peter Vaughan) is confined to a wheelchair and is the face of government, the closest thing to Big Brother but more real, less effective and possibly orchestrating the 13-year bombing campaign. 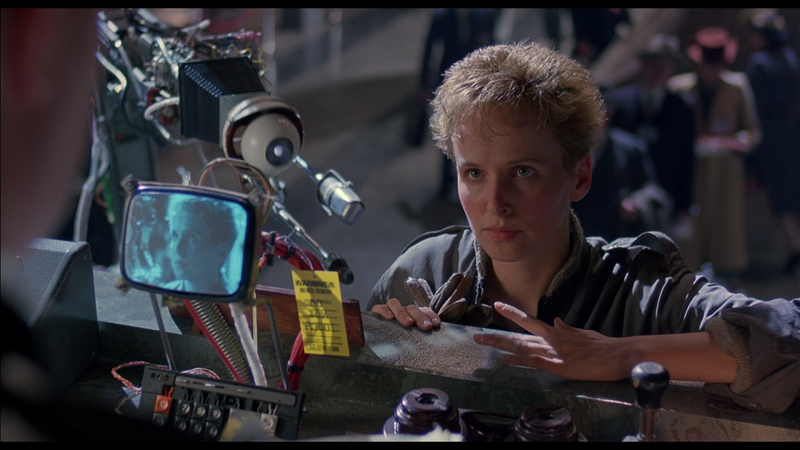 The film's set designs and aesthetics are legendary. 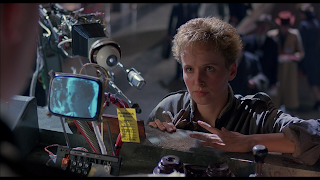 Gilliam creates a grim world where everything has progressed in the wrong direction under government micro management. Surveillance is everywhere. Uncoordinated ducts dominate every interior space. Cars represent hideous design by committee. Government buildings are imposing spaces from the outside but inside, bureaucrats in tiny offices fight over desks and cabinets literally divided by walls. Rich women's latest fashions include outlandish hats with upside heel designs. Security men are oversized and overweight. Computers are flat screens bolted on to 1940s-era typewriters. Pro-state fascist-style posters dominate every wall space. Few movies have ventured this far into creating a viable, pathetic vision of a society in a march towards irrelevance. Amidst the madness, Jonathan Pryce holds the film together with a performance combining subdued resignation with an itch to break free. His Sam Lowry is a dedicated government man, but unable to resist the temptation of freedom once his dreams to escape the inescapable take hold. Brazil is the title of the airy 1939 Ary Barroso song playing almost endlessly in Sam's head, representing the promise of somewhere else, anywhere away from here.